My son's new house, yard. Cody goes crazy with fireworks. I used to raise German Shorthair dogs and you can shoot a gun right over their heads. Not Cody, I drop a pan on the floor and she dives under the bed. In Montana, Helena and Billings outlawed fireworks this year. I didn't hear one "loudenboomer" in Helena but I spent a couple of days at my sons in Bozeman and I thought I had dropped into a war zone. His new house is finished and the yard is seeded in Idaho Fescus. a drought-resistant grass that needs no mowing. My brother and I took the 2 mile dog walk on Saturday AM. Then I walked with son's neighbor to the Farmer's Market and all around the grounds. That place is HUGE. When I returned, my son suggested a walk so we walked (I don't know how many miles) in the woods along the river. I guess we are just walk'n fools. Ha But my hips feel it today. Back home to routine today. I have an acupuncturists appointment this AM and I'm teaching Flamenco this afternoon after the moving break. Hope everyone enjoyed the weekend, the 4th and Canada Day. Sending love to all my bloggie friends, where ever you may be. Funny thing... my mom and I went with our neighbors to the Farmers Market on the 4th. We came home loaded with fruits and veggies. It's been Marathon Eating since. Matter of fact, I am sitting here with a bowl of chopped up fruit while I type this... ha! Tom Selleck... seriously? Some people would write an entire post about that experience. You drop it in as an aside. You kill me. Thanks for poking me because I did miss your post when I was in Bozeman. Sorry.... I never mean to but it just happens sometimes. (like merde) Don't you love the farmer's markets.... I bought some more plants...... 4 and that was all I could fit in my basket and then carry back. My son and wife had gone to the market while I was walking with my brother and they got the food. Your fruit sounds delish. What, no Tom Selleck stalking? Over that I'd really fawn. My cat Ruby DID NOT like the fireworks this past weekend. She spend two whole days under the bed LOL. My dogs get spooked as well. Bentley growls incessantly and Lylah squeezes her 110 pound frame under the coffee table. Tom Selleck is the best! (Not because he is a hunk, which I wouldn't know, but because he is a great guy in and out of the movies). You need a good size coffee table for that dog to hide under. My husband thought very highly of Tom S. too. Awwww Cody is a sensitive soul!! Yay for all that walking! Hope your hips are feeling better! Our doggie can't handle fireworks either. Neither can I, when I'm at home, not expecting them. They were banned here in New Mexico because of the drought. I hate to be an old kill-joy but I wouldn't mind seeing the fireworks banned all over. I guess people are not careful and it does start fires. My dog goes absolutely freakin' NUTS with fireworks. Thunderstorms? Nary a peep. But, set off a firecracker and he melts down. That's strange because the dogs I know that are afraid of fireworks are also afraid of storms. You have a smart dog that can tell the difference. Incidentally, you were DOING laundry? Is that a pet name for someone, perhaps? I think it's very healthy to get these sort of pretend crushes of celebs and tease about them. Good for you guys and your crushes!!!!!!! I really thought Selleck was a hunk but more than that I always liked that my husband also said he was such a good guy and I know Calvin highly respected him for being a worth-while person and his baseball knowledge. Mighty blew out his first knee due to fireworks. He tried to fly off the porch in fear. Love Tom Selleck and Robert Parker(the author) so the Jesse Stone series was a must see for me. Must be time for a new episode. I feel so sorry for the dogs when those fire cracers are popping all over. Poor Mighty, running in fear. Cody first runs in circles not knowing where to go and finally dives under the bed. Yes, hope they make new ones because I've seen all the old ones over and over. I think I read that Tom and his real wife were going to do a series about (duh) a married couple. I haven't seen it but if you do, let me know. Fescue in the front yard. What do you expect, that Deer or Cattle will crop it for you? Well, if you don't expect that, you probably should. I'm glad you're moved into you new home, and are setting up to your "likes." It took me about two years to get accustomed to the apartment after leaving our house. I guess I even spelled the word wrong... Fescue as you write it, not Fescus. Shows you how much I know. I had meant to look it up, too. Son said it is supposed to get 6 inches. Many people are using it in Bozeman. Do you mean it's grass feed for cattle? I really like the neighborhood where son lives. Everyone has large gardens and pretty flowers and chickens in their yard. And they are mostly young people. I did not like the neighborhood I lived in when I had my house in Bozeman. They were young people but just wanted grass and no gardens. They didn't even plant trees. The subdivision was around 12 years old and it was stark and unfriendly. Exception my house, of course. 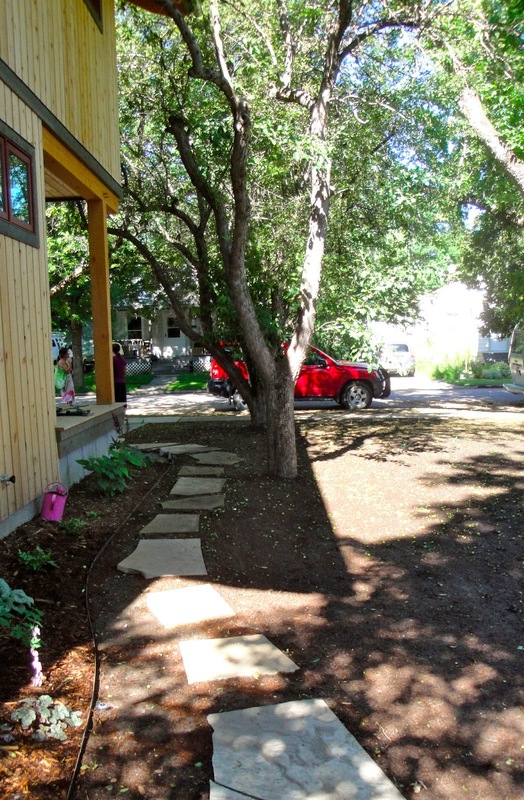 I planted lots of trees, had large stones in the yard and the back yard was full of flowers. I bet you missed your trees and flowers, too when you moed to an apartment. Penny the Jack Russell dog and modest internet superstar is not a fan of fireworks. If there have been fireworks going off and I come back to the house later, I can usually find Penny trembling in a closet. I also then notice my socks are wet. Ah yes the Fourth of July and glad you mentioned Canada Day, eh. Also, there's a consensus circulating blogland that I look like Tom Selleck. I think not. He's kinda' jealous of my amazing looks. Okay, maybe he's not. Okay, we both have a moustache, or mustache, in American, y'all. Poor dogs. Many people have agreed that their dog would also hide when fireworks were consuming the world. Poor little superstar, hiding in the closet. So, you handsome one who looks like Tom Selleck..... who is the original? I always said I thought you were the spitting image of Tom Selleck or he is of you. Somehow, that makes me rest easier. I'm not being a smartipants. Mean it. my dog hates them with a passion too. Dogs have more sense than humans. They don't have to see a re-enactment of a war each year. I got out of breath just reading this and I am a walker too, but not like this, phew! Summers are so wonderful but that grass just keeps on growing and growing. I'm anxious to see my son's grass. Quite a number of people are using it now, in Bozeman. They also sell the sod but it less expensive if you grow it from seed. It's good that they outlawed fireworks in Helena. Animals suffer a lot because of them. I dislike fireworks. Thanks for calling my attention to your comment. Often I forget to go back. I agree with you about not liking fireworks. Maybe only kids like those sharp booming noises. a drought-resistant grass that needs no mowing. I am pretty sure no such thing exists in Oklahoma. If it doesn't creep like Bermuda grass, it would be the perfect lawn. Really, no mowing? I am going to dream about that. There were lots of fireworks in our area, but not as many as usual as the guy who usually does a huge show across the street was not there this year. I am not a big fan of them, and it does seem like dogs and cats don't appreciate the noise much. There are several yards near to my son's that have this grass. It looks a little wilder and grows to 5 or 6 inches. It would sure be better than the weeds I have for grass. They can grow up to my waist. Ha. Our dog used to be terrified of firework noise. Whenever I hear those night-time explosions (and they happen fairly regularly round here) I remember Josh and it makes me feel sad. Many of the sporting dogs seem to be able to withstand the fireworks. I used to have German shorthair dogs and you could shoot a gun over their heads and they didn't flinch. They loved hunting so much and I guess they just knew the noise is all part of the hunk. Isn't it strange how some dogs can be so sound shy. I had a dog that would shake like a leaf during a thunder storm. Tom Sellek was one hot dude!! Cool your Hubby got to have lunch with him... he should have called you. Are you still on vacation? Probably so. I'm with dogs in that I don't like loud noises, either. My grandmother always used the old phrase of, "always wear clean underwear in case you are in an accident." I don't know what difference that would make. Tom S. is still hot. Have you seen him recently? He looks really rugged and craggy. Love that look. Ahhh, Tom Selleck...how I enjoy him! I wonder if his old Hawaii re-runs are being shown? I remember Tom Selleck best in Magnum PI, not my favourite show, but watchable. I'm a walkin' fool myself, all over Rottnest Island (19km off the West Australia coast) last Monday, then all over several other places the rest of the week. My hip gave me grief yesterday but is okay today, while my knee is now getting in on the act. I wish we lived nearer to each other. A couple of walking fools. We could start walking marathons all over the world like Forest Gump. Hi Manzanita .. sounds like you had a fun time - and you do get across to see each other .. The idea of those walks is making my hips ache! .. Dogs and fireworks are never very good - nor the birds! You and Tom Selleck... Wow! Did you ever sneak over to the ball field to see him for yourself? Hoping to get back into the swing of things myself, soon.